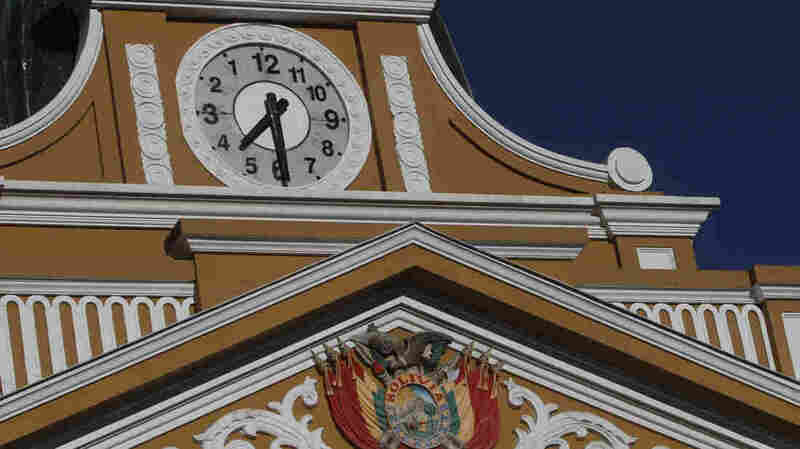 Bolivia's De-Colonized 'Clock Of The South' Turns Widdershins : The Two-Way A clock on top of the country's Congress building in La Paz now has hands that turn counterclockwise — a move by the leftist government to embrace the country's location in the Southern Hemisphere. The hands on the clock of the legislative palace in La Paz, Bolivia, are moving left to recover the identity of people living in the Southern Hemisphere, authorities said Tuesday. Bolivia's government turned back the hands of time this week — or, at least, they turned back the hands of a prominent clock in the capital city of La Paz. The clock on top of the country's Congress building now features flipped numbers and hands that turn counterclockwise, instead of clockwise, to reflect the country's location in the Southern Hemisphere rather than the Northern. The clock still tells the correct time, and the government is considering modifying all clocks at public institutions to match, reports The Associated Press. Marcelo Elio, Bolivia's president of Congress, called the clock's alteration "a clear expression of the de-colonization of the people," according to the AP. Bolivia's leftist government, under President Evo Morales, has made several attempts to remove or weaken colonial influences on the nation. "Who says that the clock always has to turn one way? Why do we always have to obey? Why can't we be creative?" he asked at a news conference on Tuesday. "We don't have to complicate matters, we just have to be conscious that we live in the south, not in the north." "Clocks are an evolution of the sundial, and in the northern hemisphere a sundial's shadow runs clockwise, while in the southern hemisphere it moves counterclockwise — making the modern clock a representation of light in the northern hemisphere." Choquehuanca calls the reversed clock a "clock of the South." The foreign minister has been wearing a widdershins wristwatch for a while, according to the BBC. He says Bolivia presented left-turning desk clocks to foreign delegations at a Group of 77 summit — but that the nation doesn't plan on imposing the new clock style on all its citizens. Several of Morales' political opponents have spoken out against the change, according to the AP, calling it a sign that "things are regressing" and an example of taking national indigenous traditions "to the ridiculous for political ends." La Paz residents have mixed reactions. The BBC says one shoe shiner told the Efe news agency, "If they want to send out the message that the country is heading in another direction, then they'll have to make that clear, because all the people who are walking past ... say they thought it was an error."